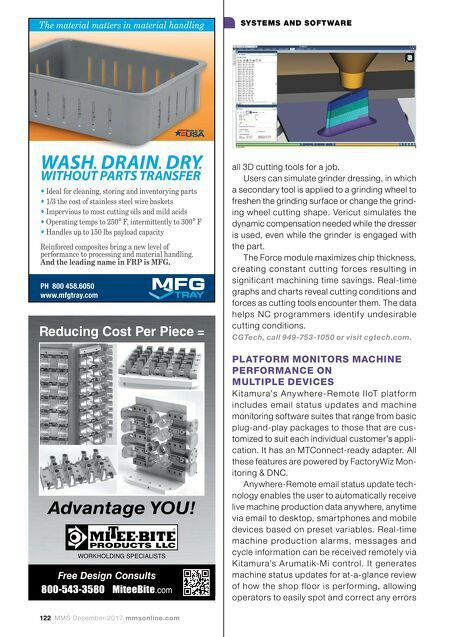 122 MMS December 2017 mmsonline.com SYSTEMS AND SOFTWARE all 3D cutting tools for a job. 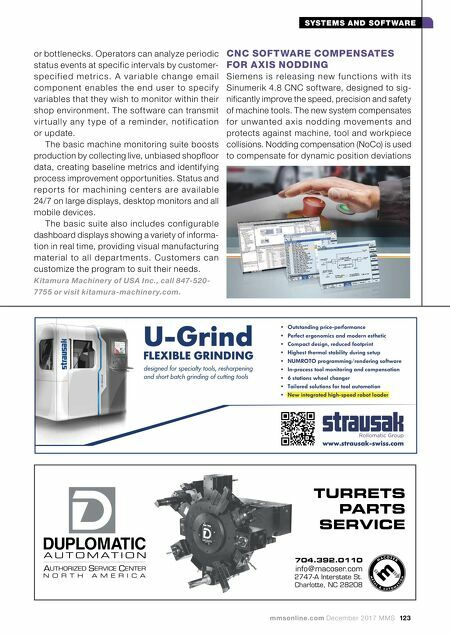 Users can simulate grinder dressing, in which a secondary tool is applied to a grinding wheel to freshen the grinding surface or change the grind- ing wheel cutting shape. Vericut simulates the dynamic compensation needed while the dresser is used, even while the grinder is engaged with the part. The Force module maximizes chip thickness, creating constant cut ting forces resulting in significant machining time savings. Real-time graphs and charts reveal cutting conditions and forces as cutting tools encounter them. The data helps NC programme rs ide ntif y unde sirable cutting conditions. CGTech, call 949-753-1050 or visit cgtech.com. PLATFORM MONITORS MACHINE PERFORMANCE ON MULTIPLE DEVICES K i ta m u ra's A ny w h e re - R e m ote II oT p l at fo r m include s e ma il status update s a nd machine monitoring software suites that range from basic plug-and-play packages to those that are cus- tomized to suit each individual customer's appli- cation. It has an MTConnect-ready adapter. All these features are powered by FactoryWiz Mon- itoring & DNC. Anywhere-Remote email status update tech- nology enables the user to automatically receive live machine production data anywhere, anytime via email to desk top, smar tphones and mobile devices based on preset variables. Real-time m ac h in e p ro d u c tio n a l a r ms, m e s s ag e s a nd cycle information can be received remotely via Kitamura's Arumatik-Mi control. It generates machine status updates for at-a-glance review of how the shop floor is per forming, allowing operators to easily spot and correct any errors Reducing Cost Per Piece = Workholding SpecialiStS 800-543-3580 MiteeBite .com Free Design Consults Advantage YOU!